Plot synopsis: On the eve of his wedding day, a man is press-ganged into the crew of a spaceship about to embark on a fifteen-year journey to Alpha Centauri. Review: Absurd. This is all that really needs to be said to describe this episode, which attempts to transpose a plot straight out of a nineteenth-century seafaring tale into a futuristic setting, and as a result makes almost absolutely no sense. The story asks us to believe that a spaceship's crew can be made up of simply anyone - regardless of qualifications - who can be pressed into service, against their will, as if a space vessel were no different to a traditional seagoing one. It's hard to get beyond the inherent ridiculousness of this idea, especially when many of the characters even speak as if they are from the nineteenth century. It feels almost as if the episode were based on a script left over from some historical adventure series, with just a few words changed here and there - 'space' for 'sea' etc. - though, in truth, it was not. I would also advise anyone intending to listen to this story not even to think about trying the Dimension X version - it's more than five minutes longer, which is definitely not a plus, since all this means is even more nonsensical rubbish. Dire. Plot synopsis: An advance party of microscopic aliens invades a human body to prepare it for full colonization - yet a major surprise awaits them. Based on a short story first published in Galaxy Science Fiction magazine, in June 1957. Plot synopsis: When a colony world that has been out of contact with Earth for two hundred years is informed that they are to be visited by an inspector from the Earth Empire, its inhabitants have to modify their ways to prove that they do not deviate from Earth norms, including trying to persuade a member of their crime-free society to become a criminal. Based on a short story first published in Galaxy Science Fiction magazine, in December 1954; and later in Robert Sheckley's short-story collection Citizen in Space, in 1955.
Review: This is one of X Minus One's smartest, and most entertaining, episodes. The plot centres on a small colony world that appears to be close to an anarchist Utopia: although it has a mayor, it has no laws, no police and no crime. In many respects, it therefore seems like an almost ideal society, where everyone lives in cosy harmony. Yet its major weakness is that it also seems to have no ability to defend itself, or the way of life its citizens have created, since as soon as it comes into contact with a more rigid, militaristic society - that of Imperial Earth - its inhabitants simply cave in to the demand that they conform to the Earth model of behaviour and organization, to the extent that they even try to make one of their own become a criminal, just because they believe this will please the Earth authorities. As such, the episode satirizes both authoritarianism and conformity, and the sort of pacifistic anarchism that has no answer to the question of how to stand up to a more organized aggressor. Political philosophy aside, the episode is also just plain funny, filled with clever and witty lines of dialogue. There are, too, many neat touches, such as when the colonists put up a sign reading 'No Aliens Allowed Within City Limits', and mix up the ‘correct’ colours to paint the church and school house, all arising from their confused attempts to placate the inspector from Earth. 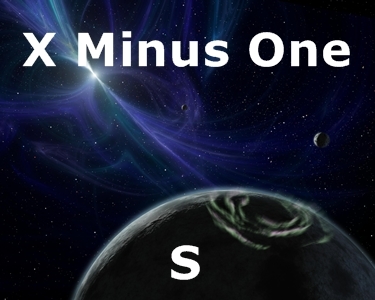 As so often with X Minus One's humorous episodes, the incidental music detracts a little - being of the unsubtle 'comedy' music variety - but otherwise, this is an excellent production, and the episode one that bears repeat listens. Plot synopsis: A sociologist who has developed a formula to explain how any institution can grow in size tests it out by applying it to a women's sewing circle, but his experiment rapidly leads to highly unexpected consequences. Based on a short story first published in Galaxy Science Fiction magazine, in September 1952; and later in Katherine MacLean's short-story collection The Diploids, in 1962.
Review: I may have over-rated this episode, simply because I work in a university, and recognize all too well the pressures placed on departments to prove their 'value', just as the fictional sociology department is forced to here. Those less familiar with - or uninterested in - the world of academia may not find the story so compelling (or amusing), though anyone who works in a large organization may find aspects with which to relate, such as the over-riding concern of managers for the bottom line. At any rate, I found much in the episode's depiction of higher education, such as its suggestion that to university authorities 'academic freedom' means nothing more than the freedom of academic departments to be free from debt, sadly ringing only too true. In terms of the actual plot, one of its most striking features is the confidence it displays in the power of the social sciences, not only to predict but also to shape the future, an optimistic belief that was probably more widespread at the time than it is today (consider also, for example, Isaac Asimov's 'psychohistory', an imaginary discipline he originated in the 1940s, which he presented as capable of predicting events thousands of years into the future). What is disappointing, though, is that - despite the fact that the story upon which this episode was based was written by a woman - it offers quite stereotypical views of the genders. Thus, while the sociologist who devises the episode's scheme is a man (as is the university president who is also in on the experiment), the women in the story are little more than easily manipulated dupes. Nonetheless, there's a good payoff at the end, with a conclusion that flows logically from the initial premise, and which is both funny and clever. Plot synopsis: After half a millennium of peace, humanity finds itself under attack from an unknown alien enemy that begins targeting the colony worlds humans have settled, and it falls to a military that has long since become unprepared for war to deal with the threat. Based on a short story first published in Galaxy Science Fiction magazine, in July 1953; and later in Michael Shaara's short-story collection Soldier Boy, in 1982.
Review: I liked this episode more than I thought I would at the start. It begins slowly and the main characters - a group of dissolute, undisciplined soldiers - seem neither sympathetic nor very interesting. Moreover, initially, the plot doesn't appear particularly promising. The story belongs to the subgenre of military science fiction, which doesn't always produce the most subtle or imaginative works, and the basic premise, about the outbreak of intergalactic war, is hardly original. However, as the plot develops, it becomes more absorbing, in its depiction of a future in which humanity has become so used to peace that the military has become almost redundant, and soldiers command little in the way of respect. Yet when hostilities with a mysterious alien foe begin, the colonists of the worlds that are at the frontline suddenly realize that they desperately need these soldiers. One such soldier, the episode's protagonist, therefore has to rediscover what being a soldier means, and the story becomes a tale of personal redemption, as well as an exploration of themes such as honour and duty. The whole business about fail-safe bombs being planted on the colony worlds - to be used in the event of invasion, to prevent their technology being captured by alien forces - seems like a contrived plot device, but there is still enough here to make it an intriguing episode. Plot synopsis: A man wakes up one morning to discover that a strange machine has mysteriously appeared in his room, which turns out be a 'Utilizer', a device from the future that is capable of granting his every wish. Based on a short story first published in Galaxy Science Fiction magazine, in June 1954; and later in Robert Sheckley's short-story collection Citizen in Space, in 1955.
Review: Be careful what you wish for is the message of this clever, and very funny, episode, based on a short story from the bountiful imagination of Robert Sheckley (as my Authors section shows, Sheckley was the most frequently adapted writer on X Minus One, and many of the episodes drawn from his work are among the series' finest). The episode has a running time of around only twenty minutes, but in that short space, it manages to pack in a dizzying number of ideas. The set-up presents a science-fictional spin on a plot that is probably as old as storytelling: a man is given the means to have all his wishes come true (in this case, thanks to a technological device, rather than the traditional genie in a bottle), but as hinted at by the title, does this incredible good fortune come for free? Most listeners will doubtless guess that, no, there is bound to be a price to be paid, but I for one did not predict the nature of the surprise twist at the end, which is one of the best of any X Minus One episode. The payoff is both amusing and ingenious, providing a satisfying conclusion to an excellent story. And on a final note, if there were any justice in the world, Sheckley would be as well-remembered today as any of the more famous SF writers of the period. Plot synopsis: A young child starts to display signs of extreme intelligence, which enables her to develop some amazing abilities. Based on a short story first published in Galaxy Science Fiction magazine, in July 1952; and later in Mark Clifton's short-story collection The Science Fiction of Mark Clifton, in 1980.